Cmdr. 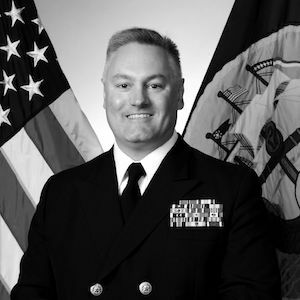 Daniel L. Mode, CHC, USN, S’92, is a man with a servant’s heart. For decades, he devoted himself to God and country as a priest and a captain in the United States Navy and says the person he’s become is largely credited to his experience at Mount St. Mary’s Seminary. The 2017 Academic Circle of Excellence inductee credits the Mount's Seminary with helping build his foundation. He weathered these storms—at times coordinating ministry for 17 U.S. and coalition Catholic chaplains to care for more than 30,000 service members. He served as a priest for more than 26 years and spent three decades as a chaplain in the Navy. His missions as a supervisory and command chaplain took him to Japan and Guantanamo Bay, Cuba, as well as the Persian Gulf for Operation Iraqi Freedom and Bagram, Afghanistan, for Operation Enduring Freedom. Unifying his education, his experiences and his faith, Mode wrote a book about the life and legacy of Rev. Vincent R. Capodanno called “The Grunt Padre,” which initiated the process for Capodanno’s canonization. In 2006, the Church officially proclaimed Capodanno a servant of God. If we can accept the truth of how God has made us, with our gifts and talents and our challenges, we can go a long way to being humble before God and others. Today, Mode is in residence at Our Lady of Lourdes Church in Arlington, Virginia, and works at the Pentagon as director for plans and operations for the Office of the Chief of Chaplains of the Navy. In 2017, he received the Mount’s Academic Circle of Excellence Alumni Hall of Fame Award for exemplary character, accomplishments and contributions to the Mount. “If we can accept the truth of how God has made us—with our gifts and talents and our challenges—we can go a long way to being humble before God and others,” he explains. “When you are humble you have a better vision of service—that it has never been about you, but what God can do through you for others.” He credits this lesson in humility to his time on Mary’s mountain. Truth, he explains, is the best one-word definition for humility and the foundation of his servant’s heart.